The AMA Indigenous Medical Scholarship Trust Fund was established in 1994 with a contribution from the Australian Government. The purpose of the Scholarship is to provide financial assistance to Aboriginal and/or Torres Strait Islanders who are studying for a medical degree at an Australian university. The value of the Scholarship is $10,000 per annum. The AMA would like to acknowledge the generous contribution from Deakin University towards the AMA Indigenous Medical Scholarship. 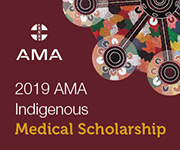 The AMA would like to acknowledge the generous contribution from the sub-fund: B B & A Miller Fund towards the AMA Indigenous Medical Scholarship.